I read somewhere, you can sleep when you're dead. Oh my gosh can I please sleep before then? Because I am exhausted. I've said before that 2012 has been quite a year, and in not a lot of time, many things have happened. I am trying this new thing where I take life as it is served up to me and enjoy every second of it. In the past three weeks, I moved my parents away from our Virginia house and road tripped back to Boston with my sister, took an impromptu bus trip to Brooklyn and had a fabulous New York Brunch, celebrated an early St. Patrick's day in Hoboken, took a painting class, ran a 10 mile race with my roommates, had a nine-day social week with my Jules where we met new "friends" (not really) at trivia, attempted to bowl at Flatbread, hit up happy hours we've never been to, and basically exhausted ourselves completely. And in the upcoming weeks, I'm going to Florida, doing another half, helping my very good friend run the Boston Marathon, experiencing my first Boston St. Patrick's Day including a 5K and potential pub crawl, taking a trip to Baltimore to see friends from college, going to several concerts and basically soaking up every little drop of life I can. Wow, okay, right, you can sleep when you're dead. But you can cook when you're alive, and this dish takes almost no time and is absolutely fantastic. So, um, stay awake? And try it? 1. Combine yogurt and whipped topping. Place about 1/3 of the mixture on the bottom of a glass bowl and top with half of the berries. Follow with a layer of cubed cake, then remaining yogurt/whipped topping and finally remaining berries. Sprinkle with coconut and serve. Fresh is best. I got tired just reading about your schedule. I don't know how you can be living it and still be upright, let alone able to walk in the kitchen. I do hope that amazing trifle gives you at least a little energy. Combining fruit, pudding/yogurt and cake is one of my favorite dessert combinations, really. 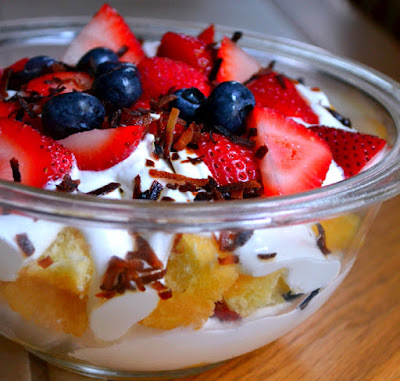 I love the trifles and to offer a healthier version makes me want to hug you.